To slow mass migration, stop the illicit capital flight from poor to rich countries. The US Investor visa program allows one to invest $500,000 U.S. in a government licensed fund for a period of about five years and in around 18 months, a conditional green card is attained for the investor and their immediate family. The investor and their family can live, work and study anywhere in the United States and there are no educational, age or English language requirements. Most experts report that on September 30th the investment amount will increase from $500k to $1.3m, a significant jump that will price out many potential investors. There is still time to file before September 30th if you start your process with ____ Capital now. The deceleration of China and resulting commodities crash have created a problem for developers of ultra luxury condominiums. The wave of mortgage refinancing by millions of households has distorted the housing market and contributed to the 2000s bubble. It makes sense for a household to refinance their mortgage when interest rates decline. In addition to lowering monthly payments, refinancing can be highly advantageous if home prices have risen from the time of the initial mortgage. But are the millions of refinancings also distorting housing’s supply and demand and de facto feeding the real estate bubble? In my view, YES. I make the case below. In essence, market prices are set at the margin when a small percentage of properties changes hands. When conditions are favorable, prices will trend upward because the supply is small and the demand is higher. But when large numbers of homeowners refinance, they are able to monetize the higher value of their homes without – and this is the key point – adding their homes to the overall supply. When a household refinances their mortgage and takes cash out in the process, they are liquidating part of their property through a private transaction without adding to the official supply. As an example, say a household has a $400,000 mortgage on a $500,000 home. Five years later, the home is valued at $750,000 and interest rates have dropped from 6% to 4%. The household decides to refinance and to maintain its monthly payment at the same level. Because interest rates are lower, it is able to increase the loan from $400,000 to about $500,000 without increasing its monthly payment. By now, the principal on the old mortgage has dropped to $375,000 and the owner can extract $125,000 in cash during the refinancing process. This amount is the difference between the new mortgage $500,000 minus the principal outstanding on the old mortgage $375,000. So far so good. But what happened to the homeowner’s equity in his home? On the eve of refinancing, the owner’s equity in his home was $750,000 – $375,000 = $375,000, equivalent to 50% of the new market value. After refinancing, the owner owes $500,000 and his equity has dropped from $375,000 to $250,000 ($750,000 market value – $500,000 new mortgage), equivalent to 33% of the new market value. Because the owner now has $125,000 of extra cash, you could say that he “sold” 17% (50%-33%) of his home equity for $125,000. The owner was able to sell one sixth of his house without subjecting his transaction to the pricing scrutiny of the market and without adding to the official supply. This is not a big issue if only a few people refinance their mortgage, but it could, and probably did, distort the normal mechanism of supply and demand when millions of people refinance. Through refinancing, a large number of households have monetized their home values (or fractions thereof) through private transactions. Had there been an open liquid supply and demand market where existing homeowners actually sold 17% of their homes, the values of all properties would have been reset at lower levels, owing to the existing homes fractional sales. Further exacerbating the distortion, the household may have taken that $125,000 cash and made a down payment on a second home, giving a further boost to home prices. So, a transaction figure, $125,000, which would have depressed prices under normal supply and demand conditions ended up pushing prices higher. 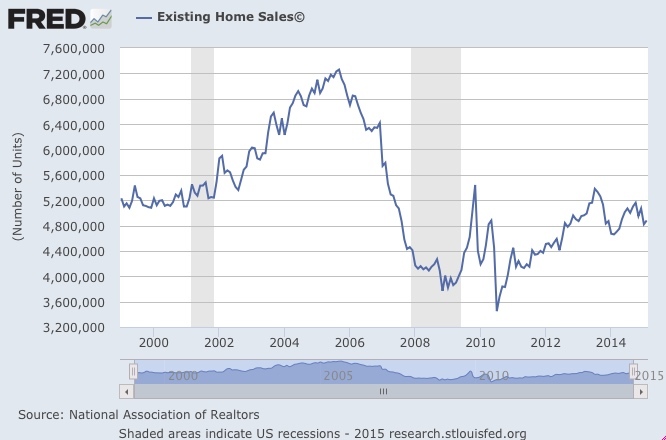 Putting this in the right context, we see in the chart above that the volume of existing home sales in the US now has an annual run rate of approximately 4.8 million units. According to the US Census bureau, there are nearly 133 million housing units in the country, which means that 3.6% change hands every year. So the market value of all residential property in America is determined by the marginal 3.6% that transact annually. Yet, using the model above, if we said that 10% of homeowners “sell” say 10% of their homes by refinancing, that would amount to an additional 1.33 million homes sold or a 28% increase which should have been added to the supply, had the fractional sale occurred in the open market rather than through a private transaction between owner and lender. The general issue is that 20% or more of transactions took place in private deals between owners and lenders without any competitive bidding or the disciplining effect of supply and demand. It is a fair bet that without these refinancings and private deals, the real estate market could have avoided the bubble of the 2000s decade and could skirt the new bubble now threatening in some cities. Lisa Larson can be reached at Warburg Realty or through her website. Disclosure: Sami Karam and populyst have no business dealings with, and receive no compensation from, Lisa Larson, Warburg Realty or any other parties named in the podcast.